Do you love a good watermelon mint salad recipe, but don’t like the kind with feta? Well, you should make Asian Watermelon Salad instead! 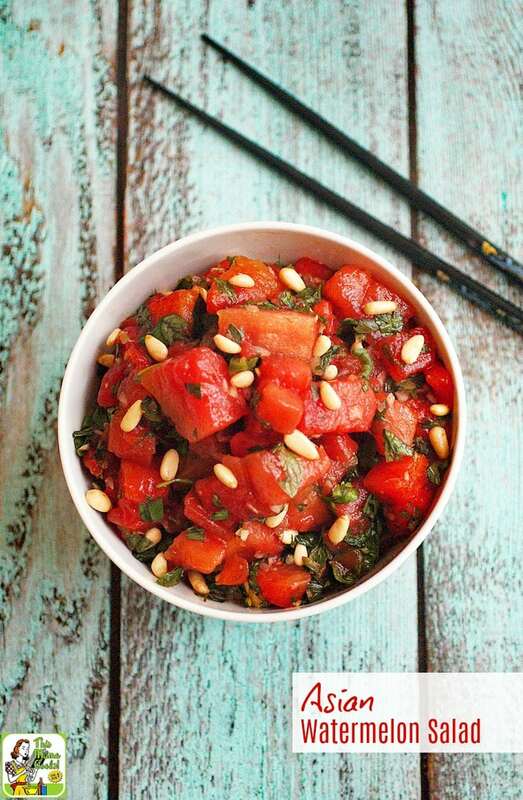 Mint, cilantro and basil, plus sesame seed oil, tamari sauce, and citrus flavored rice vinegar gives this healthy watermelon salad recipe a unique Asian flavor. Not only is it an easy watermelon salad recipe to make, but it makes a wonderful summer side dish for weeknight dinners or weekend BBQs. This Thai inspired watermelon fruit salad recipe would go well with grilled teriyaki beef or chicken cooked up on the grill. Perfect for summer! You can assure all your gluten free family members and guests that this Asian Watermelon Fruit Salad is OK to eat because you’re using tamari sauce instead of soy sauce. Also, make sure to double check that the fish sauce doesn’t have any wheat or soy sauce in it. 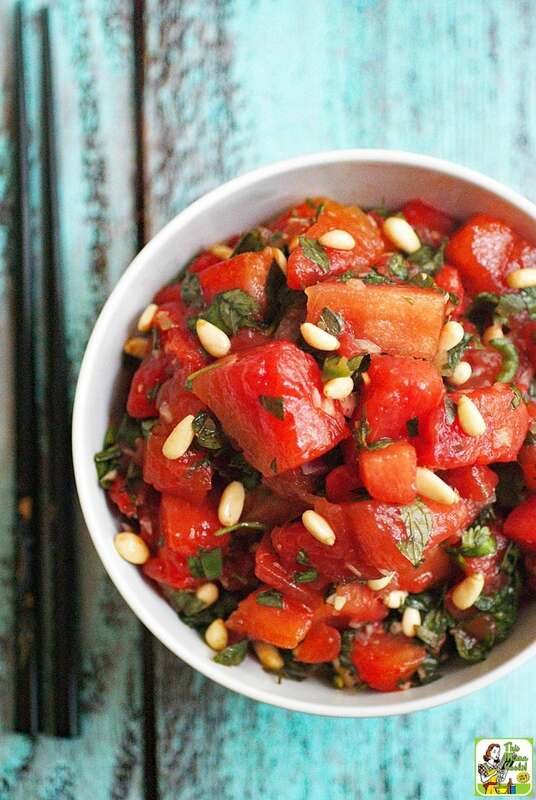 This mint watermelon salad recipe is also nut free since it uses pine nuts instead of peanuts. (Pine nuts are actually seeds and not nuts.) However, pine nuts are usually manufactured on the same machinery as regular nuts, so you may choose to rinse the pine nuts very well in warm water and then sauté them for a few minutes in a hot frying pan to remove any moisture. This will probably remove any allergens. But when it doubt, leave the pine nuts out! Ask your allergic friends or family member for their comfort level in using pine nuts. Don’t assume. You can always serve the pine nuts on the side. Speaking of nut allergies, my daughter, who is allergic to nuts is also allergic to sesame seeds. If that’s the case at your house, instead of using toasted sesame seed oil, you can use a little more lemon flavored olive oil. I love lemon flavored olive oil for sautéing vegetables, cooking eggs, or making marinades. That little hint of lemon is so delicious! Finally, if you can’t find citrus seasoned rice vinegar, a natural rice vinegar is OK to use instead. Whisk together sesame seed olive, olive oil, fish sauce, tamari sauce, vinegar, lime juice, red onion, garlic, ginger and jalapeno in a large bowl. 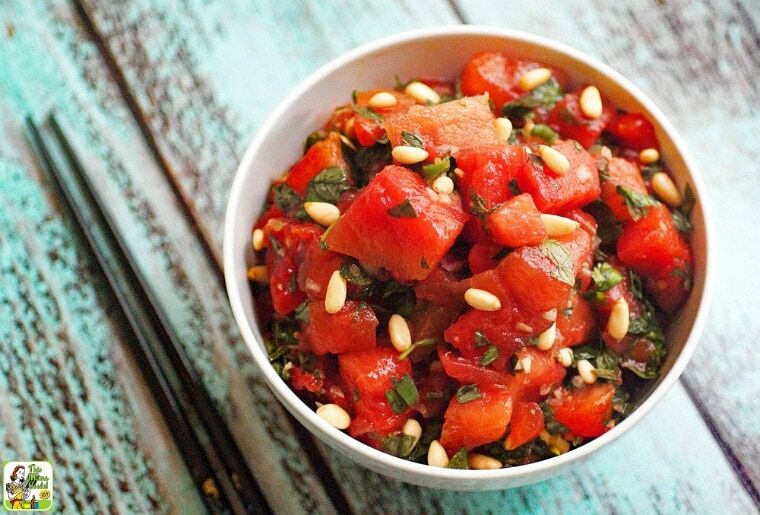 Add the cilantro, basil, mint and pint nuts to the watermelon salad. Originally published on August 29, 2013. Updated with new pictures and information.